the world to interview Manick Sorcar. An exclusive profile on Manick Sorcar was nationally telecast in India on this day at 7 PM, and repeated on Monday at 6:30 AM, both India time. Manick Sorcar was selected as "one of the highly successful people of Indian origin" , by Voice of America, Hindi TV, that was featured in their popular program "Duniya" (The World). "Duniya" is telecast nationwide by India's leading TV news channel "Aaj Tak", which draws an audience of over 30 million households. Co-anchored from Washington D.C. and New Delhi, "Duniya" is a collaboration between VOA Hindi TV and "Aaj Tak". "We know that your animation and laser displays are very well known and extremely interesting. 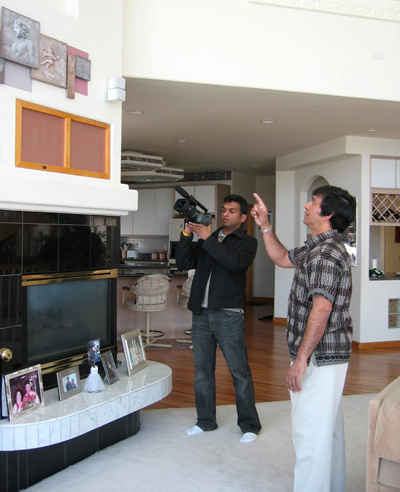 We are very keen to focus on the work that you do as a part of your profile..." wrote Voice of America in their invitation letter and prior to conducting the interview at the Sorcar residence and studio in Arvada, Colorado.